Finding a sticker that never wears away or one that gets the attention of an audience and stays in their minds needs one to do some research. A few months ago I was placed in charge of the costume design of a sub group in our religious gathering and I realized that I needed to find a design that would be used in the embroidered patches. People have different ways to do embroidery but for one whose hobby is collecting and embroidering custom patches this can be a fun job for them, unfortunately this is not my hobby so I contacted some of my friends who are passionate about design and they gave me a lead. In this era where everyone is coming up with innovative and unique ideas, you have to customize your style and idea to produce a quality brand. In the past these patches were restricted to astronauts and the military, but presently they are being used everywhere to promote and impart recognition to the logos and identity of a particular institution. Embroidered patches are a good way to improve the branding value of a given society especially when it is done to one’s own identity and designed your way. 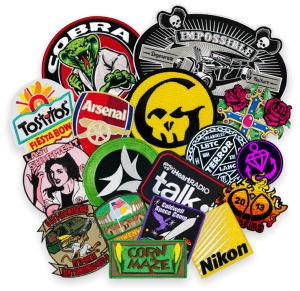 I learnt some bit more information on the range of embroidered patches that are available and these include; flag patches, military patches, insignia patches, martial art patches, motorcycle patches, sports patches, logo patches and cartoon patches. Back in the day, embroidered patches were handmade but with the improving technology, they have been digitalized and with the help of computerized machines one can get a finer quality. Embroidering a patch requires that one gives attention to the details to produce clean edges; this has been made easier since the available machines can perfectly handle the details providing a fine product. The patches I needed were to be manufactured separately so that they could be attached to the uniforms we needed and I had to decide whether we would stitch them directly on our own or take them to an expert to do it for us. This process turned out to be fun for me, as I discovered a new thing at every stage. At the final stage where we were required to custom make the embroidered patches we learnt some tips including; firstly, the shape and the size of the embroidered patch were important. Secondly we needed to determine how much embroidery would be used on the design. Thirdly what were the quantities we needed to purchase, and lastly the specific requirements that we preferred for the designs. The advice I got was ideal and it came in handy as I produced a brand that received the approval of all the members of our group.